Following the talks that took place at the highest level at the Kuk Saray Palace in Tashkent, the presidents of Uzbekistan and Tajikistan on August 17 signed an agreement on strategic partnership between their countries, according to UzReport. The document reportedly determines the goals of establishment of a long-term and sustainable partnership and strategic priorities of the bilateral cooperation. Besides, Tajik President Emomali Rahmon and his Uzbek counterpart Shavkat Mirziyoyev adopted a Joint Statement. 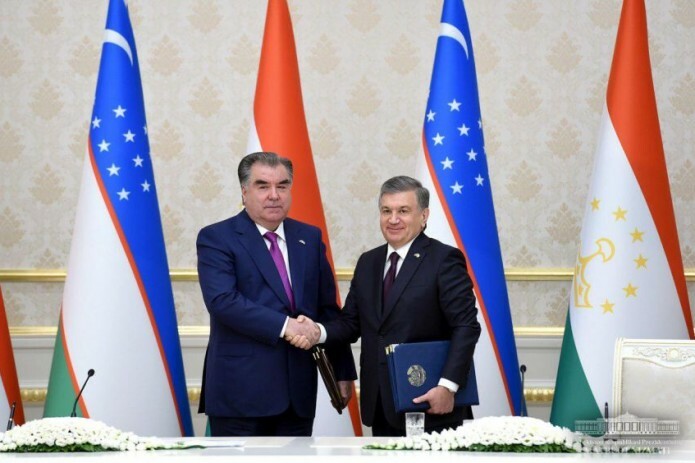 In all, Tajikistan and Uzbekistan signed twenty-seven cooperation documents in Tashkent, including agreements on cooperation in industry, standardization and certification, border crossing, recognition of education documents, geodesy and geology, agriculture, etc. The sides, in particular, signed agreements on trade and economic, scientific, cultural and humanitarian cooperation between Uzbekistan’s Surkhadarya region and Tajikistan’s Khatlon province and between Uzbekistan’s Samarkand region and Tajikistan’s Sughd province. UzReport says both heads of state expressed satisfaction with the negotiations results and the signed agreements.